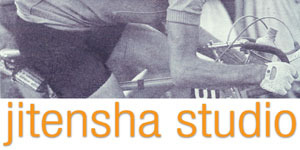 Jitensha Studio is very different from other shops. Rather than stocking a lot of ready-to-go parts and bikes, we work with each customer on custom orders for hand crafted steel frames and the parts to outfit them. The frames are designed by owner Hiroshi Iimura and built to his specifications by frame builders in Japan. These range from limited production to full custom models, though all are hand made to the highest standards. Over the thirty years we've been in business we've designed everything from traditional steel racing bikes to sport touring, tandems, and full-on touring bikes with racks, fenders and lighting. In recent years randonneuring bikes have been among the most requested. Because there are so many different purposes and possiblilties, there are a lot of choices to make. It can be overwhelming trying to decide what fittings and braze-ons to include, what tire size, and what components to use. There are so many ways to make choices that conflict with one another or compromise the strength or handling of the bike. We work with you to help you make the best choices and end up with the best bike for your intended purpose. Bikes from Jitensha Studio are notable for their truth to purpose and clean, elegant looks. That is Hiroshi's real mission and talent.